Immediately when an OEM releases one hell of a product like the flagship HTC One, then later releases a 'middle range' device, it's hard to not think of it as a truly 'lesser' device. 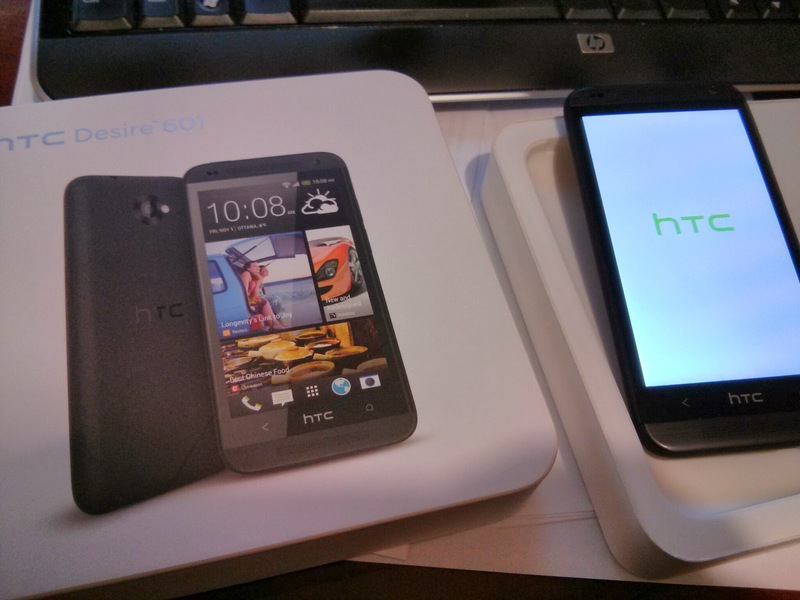 But surprisingly the HTC Desire didn't really disappoint. Maybe my expectations were pretty low... who knows. But this is not a bad device for the price and made me re-evaluate how I think about non-flagship phones now. On the specs alone it looks pretty much 'last year'. There is LTE. A dual core processor with only 1GB RAM? Less than 720p display? 8GB storage... the 'complaint list' can get pretty long. But maybe I'm just spoiled with flagship devices. The 4.5" screen is not too bad actually, it's not all that much smaller than a Nexus 4 at 4.7". I just wish that the resolution was little more 'current'. That being said, the display is very nice. Crisp edges where it should and nice black displays. No complaints on the quality of the screen. The back has the same texture as the Nexus 5, which is a rubbery'ish back. Gives you good grip on the phone. So no fear of slippage. Speaking of the back, it is removable to get at the battery and the SD / SIM slots. Power is still on the top like the HTC One, and also like the One, there's 2 loud speakers facing forward (one on top, one on bottom). I just still am not used to soft buttons. But that's just me. Sense 5 is all there, and some love it. If you want to see some of the Sense features you can check out the review I did on the HTC One for more in-depth. Blinkfeed is a growing like lately with a lot of users, and I have to say it just being RIGHT THERE all the time does come in pretty handy. I'm just not used to the vertical scrolling of the app tray, and how it has to be one panel at a time, versus a continual scroll. Is it just me, or is Sense getting less and less bloated? As it's missing the IR port of the One, it doesn't have the TV app, so it should only be one less, but it seems pretty minimal - as the device is very snappy. I love how it maintains the toggles switch on a separate notification/shade pull down like stock does and doesn't clutter up the notification area like other UIs do (I'm looking at you Samsung and LG). Battery seems to be as per normal. I haven't really set it up as a daily driver, but I haven't noticed super huge drains either. It's only a dual core, with a smaller screen with less resolution, so the draw can't be too bad. And besides, HTC has a really good battery saver option that kicks in when it gets around 15% that does help make it last longer than you'd expect. Now, it's not 'ultra pickels pixels' like the One... however at 5MP don't count it out just yet. The One uses 4UP, which has a sensor size of 1/3" (2µm pixel size)... the Desire 601 has a sensor size of 1/4" (1.4µm pixel size). Typically most sensors are less than 1.1µm. So the Desire isn't as 'big' as the Ultra Pixel in the One, but it isn't as small as other devices are, so it rests in the middle somewhere. The shots I've done are not too bad. HDR mode is REALLY fast, so I'd almost suggest taking all shots in that mode. I was most surprised with the Front Camera... with only VGA quality it wasn't too bad (you can see the wrinkles this old body is starting to develop around my eyes...). I expected much worse. Minus no longer likes to upload files bigger than 15MB so I'm uploading the Zoes to YouTube. I love how HTC brings together some of your shots in a 'theme' and puts a movie together, kind of like how AutoAwesome does on G+. All without you having to think about it. I went out to a park to take some photos and later there was a video in the gallery of them all put together. Nice! I was really expecting a lot less with this phone, but was happily surprised with its quality and ability. Right now the phone sits at $300 on Koodo, but $150 after tab (free on most other carriers with a 2 year plan). Not a bad price for a really decent phone.